Set up as an autonomous organisation under the Deptt. of Electronics (now Minstry of Communications & information Technology) Govt. of India, the prime objective of the DOEACC Society, is to bring the most updated global industry relevant computer education, within the reach of more and more. Realising the wide gap in the availability of quality computer professionals to meet India's ambitious leadership plans in software exports, the society has revolutionised computer knowledge dissemination, by offering its meticulously prepared curriculum through the non-formal sector. DOEACC's holistic quality policy entails the creation and regular upgradation of curriculum by the country's leading academia and IT professionals; offering these courses through painstakingly screened accredited institutes; regular staff training at the institutes to ensure knowledge updates; centralised examinations at several centres across India to ensure seriousness both at the institute's and individual's level. Right from a familiarisation certificate Course on Computer Concepts (CCC) to the foundation (O) level, Advanced Diploma (A) level, MCA Degree equivalent (B)level and M.Tech Degree (C) level, the society offers students who couldn't qualify for engineering colleges a lifetime opportunity to acquire knowledge and qualifications at par with the best in the country. A fact that is perhaps best echoed by the whole-hearted support to the scheme, by leading IT professionals and educationists. A unique feature of the scheme, is it's facility for horizontal entry to students from non-accredited institutes - so a student with a certain minimum level of computer knowledge need not start at the foundation 'O' level. 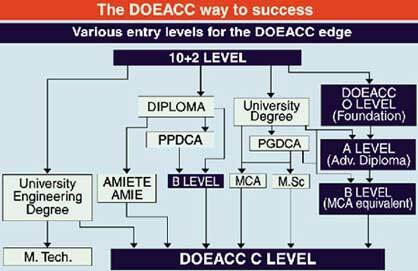 For More Detail of DOEACC Programme Log on to www.doeacc.org.in.